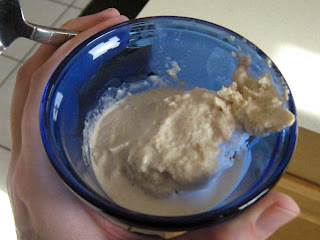 This was my first attempt with the new ice cream maker, in fact I let my 3 year old make it. It's a small recipe and will make about a half serving, for an adult or in my case, two very small child sized servings. That being said it is very easy to multiply the recipe and it doesn't get easier than this. Yup, that's it. Like I said it's very simple and just a beginning recipe. I wasn't even going to post it, except it's so yummy I had a smidge today with my lunch! Sometimes simple is the best kind of yummy!